St Pete isn't just about glorious palaces and mind-blowing churches. It's also about glorious mind-blowing Russian ballerinas! 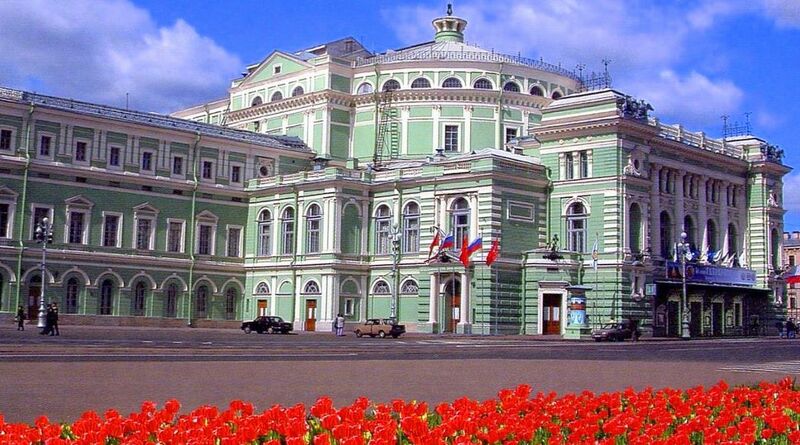 I was guttered that I hadn't managed to make my way into the world-famous Bolshoi theater in Moscow. 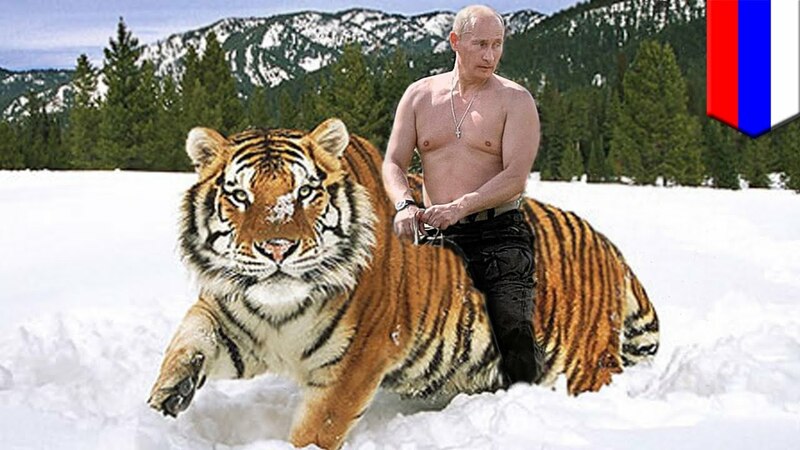 So it would take a bare-chested Putin riding a tiger to deny me entry into the (not quite) as-famous Mariinski in St Pete. A tip to the Russian backpacking novice: these theaters are INSANELY popular with both tourists and locals alike. 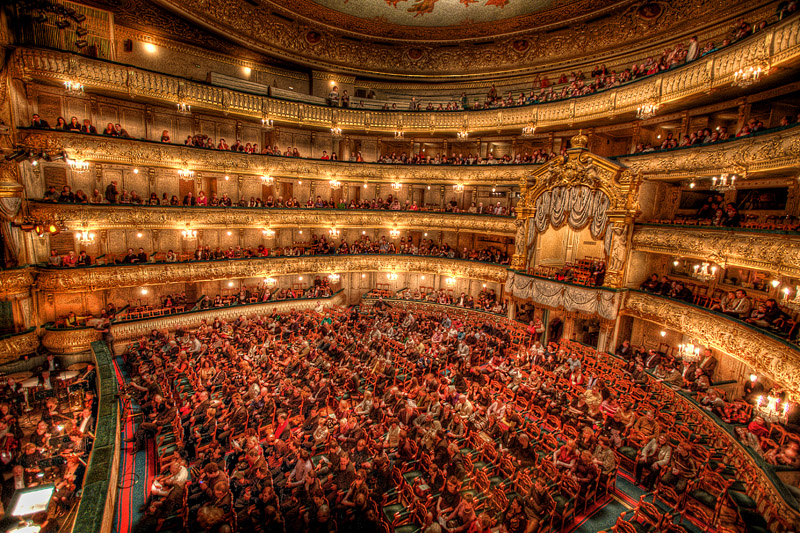 Russians love ballet like the French love Nutella. Which, if you don't know, is like how Americans love guns. They hug them and squeeze them and ... oh wait, where was I? 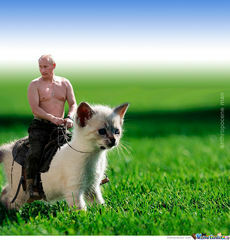 The "Putin riding things" meme is endless fun. And did you know Bear-Sharks are surprisingly furry? Every show, afternoon and evening, for the entire week I was there was sold out. I nearly cried at the ticket office. The old babushka behind the window looked at me and asked where I was from. I told her California. "California! American!" 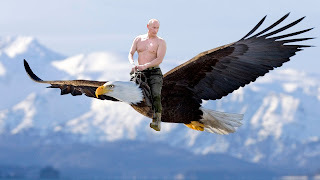 (This was before Putin's recent anti-American propaganda campaign.) She tapped on her computer a bit. And then, "For You. Ticket to Swan Lake tonight. You can go?" "Da!!" In her outstretched hand, there it was. A golden ticket. Now, there are basically three classic Russian ballets to pick from. 3) Swan Lake, by (take a guess?) ... Tchaichovsky in 1895. So getting a ticket to one of the Big 3 is quite nice. And unless you hate music itself, getting a chance to listen to a god like Tchaikovsky performed live is always a treat. But to hear his music in Russia?! Now that is like giving a dog a whole bag of Beggin' Strips. I couldn't wait. Swan Lake is classic story about how an evil dark princess/Voldemort/Vader secretly plots to take over power from the good prince/Dumbledore/Skywalker. Ha! Are you kidding no one cares about the plot. It's just a joy to watch the lithe dancers glide about the stage like actual flying swans. Fantastic. Mesmerizing. Wonderful. It is striking how wispy and thin they are, like the stalks of a dandelion. I couldn't help but think of the price they paid to be on that stage. They were insidiously, beautifully perfect. Tchaikovsky realizing he forgot to record the new episode of "Game of Russian Thrones"
Invariably, when I said the US, there was usually a smile and something along the lines of "Oh I love America! It seems like such a good country compared to here." It was as if they were going out of their way to break the stereotypes of the Cold War and show that those days were over. To be fair, I mostly hung out with younger Russians, and can only assume that older Russians who lived through the Cold War might feel differently. Like that time I almost got beaten up by a steely Soviet military officer because his girl said hello to me. There is definitely perhaps a bit of danger, but apparently its nothing like it was in the crazy 90's when foreigners got asked for their papers all the time. I rarely saw police and when I did they seemed bored and certainly weren't stopping people. Things have definitely changed here, there are shopping malls and bars and music. It seems pretty open and relaxed, at least to me as a tourist. People seemed a little cold and gruff during the day, but at night they were extremely friendly, especially when they were out drinking. Just like China in that way. After a few drinks, people coming up to me right and left and introducing themselves. My lonely planet phrase-book was worth more than gold, especially the part on meeting girls which turned out to be hilarious to both local guys and girls. Of course, I have to remark that as beautiful as Russia is in the summer on the surface, and as well as things are currently going, there is something strange about modern Russia. 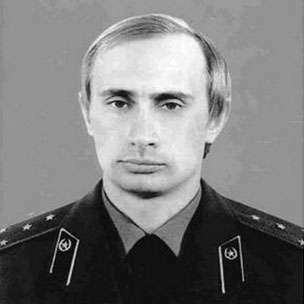 I wasn't there long enough to put my finger on it ... but how could such nice, hard-working, friendly people elect Putin, a man who yearns to take Russia back to its bellicose autocratic secret police days? Did nostalgia and longing for a failed Soviet Empire still beat so hot in Russian veins? And, why was there not a drop of graffiti anywhere near the center of Moscow? And the shut-down of all free press? It was almost Orwellian. Why did I witness a man get jumped by 3 others, kicked and beaten right to a bloody mess behind me, and no one stepped in to stop it? Was this normal? Why are there constant stories of deep corruption, of the bizarre tastes of the ultra rich oligarchs who run the country? To be fair of course, America has more than its own share of problems. But the corruption seems much deeper here, an unspoken fear of the government lies hidden just beyond my tourist eyes, and the strongman ruling over it all is slowly becoming a mythic god. 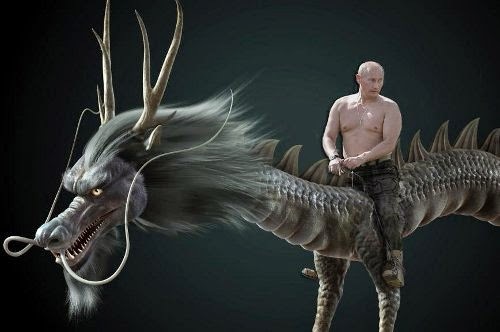 A savior, who will bring Russia back to it's glorious Imperial past. 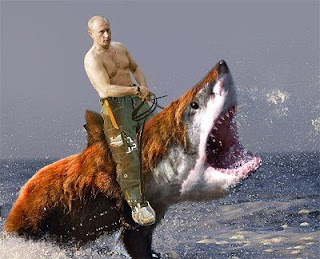 Shirtless, riding a fur-covered bear-shark. Or something like that. In truth, I only got a hint of that in my short month here. Instead, I will miss the pretty pastel train stations, the fallen headless statues of Stalin, the old crumbling gray Soviet apartments, the lonely Russian space shuttle rusting away in a children's park, the endless joyful wedding parades of Russia's summer, the overflowing flowery parks, the clickety clack of days-on-end watching a continent drift by in a musty pink restaurant car, the sparkling golden onion domes of whimsical churches, the endless parade of anonymous superstar models in tight red dresses and high heels, the genuine affection for classical music, the goofy bad dancing to Abba's Dancing Queen at night, the sounds of an accordion in the Siberian countryside by a fire. And ballerinas!! Who doesn't love them? I loved being a rock star out at night. Back home a regular Joe, in Russia a rock star. Most of all, of course, I will miss the friendly people I met, who were so excited to reach out from their Russian bubble and make a new friend from abroad. They are good people. Just like there are good people in every country. And they were looking to connect with an American. With me. That is what I will miss the most.